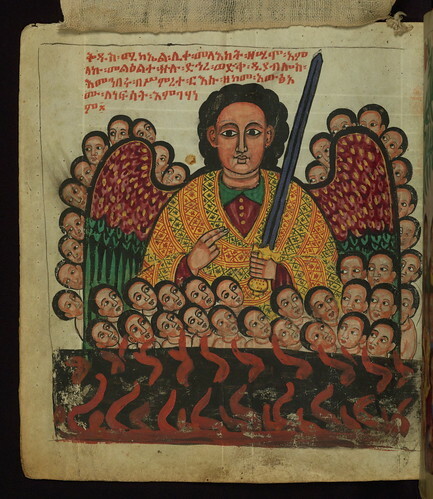 Ethiopian Manuscript, Gondar Homiliary, Walters Manuscript W.835, fol. 10v, originally uploaded by Walters Art Museum Illuminated Manuscripts. This Homiliary was created in Gondar, Ethiopia during a period of artistic flowering in the late seventeenth century. The Imperial court and its accompanying aristocracy took up permanent residence in Gondar at this time, and the taste of these wealthy patrons for paintings and extensive image cycles is exemplified by this richly illuminated manuscript. The text, a Homiliary focused on the miracles of the Archangel Michael, combines liturgical readings with forty-nine brightly colored renderings of God, St. Michael, and the miracles related in the text. Sections of the manuscript would have been read aloud on monthly feast days of the Archangel, and the images would have punctuated the readings. The artists were likely trained as painters, rather than solely manuscript illuminators, and their art can therefore be linked stylistically to contemporary mural painting. Here St. Michael Rescues the Faithful from the Flames of Hell.